Non-invasive detection of a HI or LOW flow. Two complementary NPN outputs (up to 50 mA) to control user relay or digital input. Two LED indicators for visual monitoring. The Optical Sensor Switch is a non-invasive means for detection of a HI or LOW flow. This sensor is ideal for signaling an alarm, cutoff valve, or other device when the float passes the detector (alarm, valve, etc. are not included). The Optical Sensor Switch helps protect processes and equipment from damage caused by extreme flow rates. Used in conjunction with P, S and T Style Flow Meters. Its compact design and ease of operation make it a non-obtrusive, simple to use addition to your flow meter. 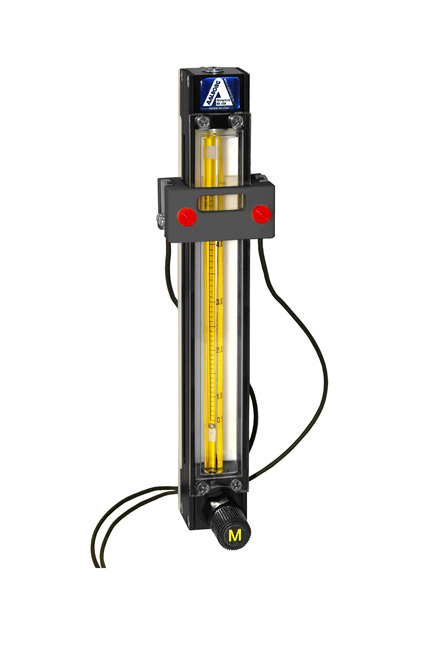 Perfect for OEM applications, use whenever maximum or minimum flow levels need to be monitored automatically. It also can be used in conjunction with a control relay to power alternate equipment or monitoring devices. A self-contained miniature photoelectric sensor (Thrubeam type) consisting of a transmitter and receiver are mounted at opposite sides of the flow tube on a solid carrier. The float inside the flow tube is detected as it passes across the beam of light. The sensor can be used to detect the float passage beyond the setpoint of the sensor and can also be set to monitor the float position at a specific level, signaling when the float is outside of the range of the sensor light beam.